St Mirren's Adam Hammill scores from the halfway line during their 2-2 draw with Hibernian. 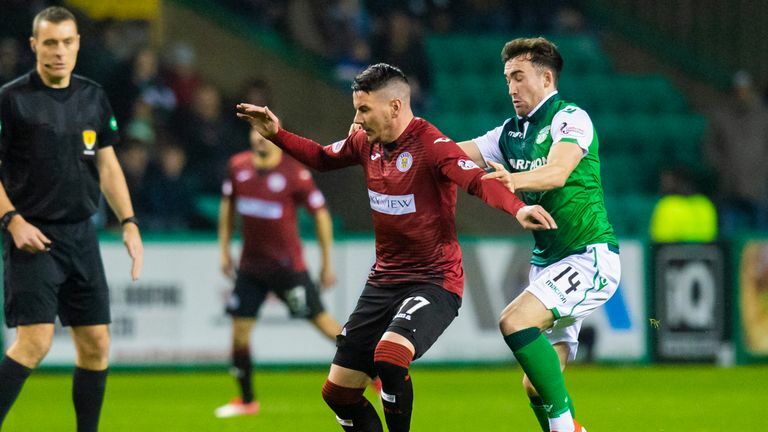 Adam Hammill produced a contender for goal as he scored from inside his own half in St Mirren's 2-2 draw at Hibernian. There were just six minutes on the clock when Hammill saw former Liverpool goalkeeper Adam Bogdan off his line at Easter Road. Hammill was himself at Liverpool during the days of Xabi Alonso and he produced a moment of brilliance reminiscent of strikes from the former Spain international during his days at Anfield. 15,096 were in attendance to witness the majestic effort, but Hammill's fourth goal of the season was not enough for victory as Hibernian fought back to earn a point. Hit play on the video link above to watch Hammill's strike from the halfway line.